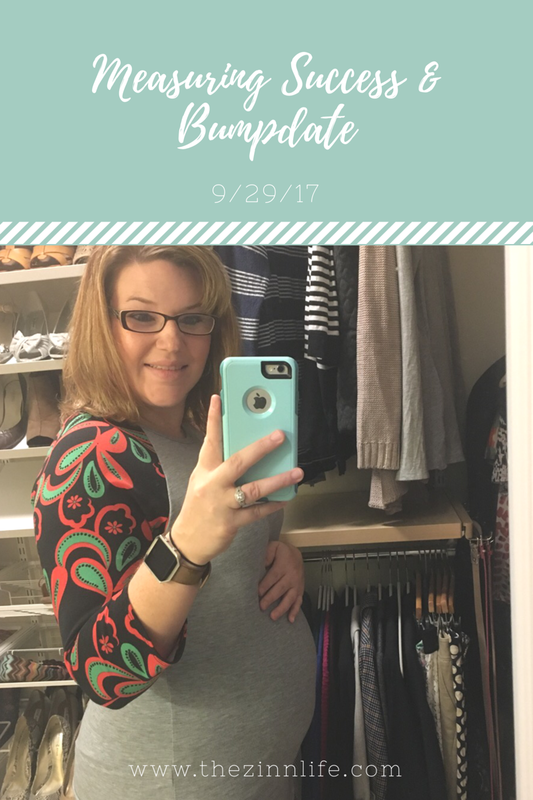 I decided to keep doing my monthly progress update and combine it with baby update, now called bumpdate (I think I'm hilarious, bumpdate)! I don't feel the need to report on pregnancy every month, but I feel like once a month would be fun and not annoying. In addition, it'll be interesting (at least for me) to see what changes as we move further through this process! Cravings: I've decided that cravings are "I see it and want it." So, basically anything terrible for me. And sweets. I want something sweet every day. It doesn't have to be a lot, sometimes just two cookies will do it, but man I want it every. single. day. Weird stuff: Round ligament pain. I'm over this mess. Thursday was especially fun and it makes spin class interesting. Some days I come out of the saddle just fine, others is a big ol' nope. Fun stuff: We find out the gender next Friday! I'm pretty excited about it, even though I don't always look excited when people ask me. Lack of energy is a real thing. We'll be doing a gender reveal for our friends next Sunday. Let's be honest, though, I'll already know because I'm a control freak. Own what you are. Weight gained: Ah, back to the good stuff. I've gained 10 pounds. I'm not weighing myself between appointments and the one before last was after two weeks of travel and refused to look at the scale so I'm not sure if that made the overall gain worse or not. I'm trying to eat healthy and make good choices when I can, but man is it hard! Exercise: So, I'm in the second trimester. Things are supposed to be grand. They aren't bad, but they aren't grand. Which is pretty much like the first trimester. I'm still averaging four classes/workouts a week. This week I'll actually have five! Endurance: It's slowly leaving me. I've had some really good classes where I've felt like my normal self and burned about 400 calories, but that's not really the norm. There are some days where I feel like a bus hit me, cancel class and go walk two miles instead. I listen to my body and take it easy when I need to. Running is pretty much non-existent and hard these days. When I walk, I try to jog a little. I can make it about 1/3 of a mile before I'm completely out of breath. We run in class sometimes and it's pretty hard to accept that I'm the slowest one in class because that's where I was when I first started. I know, I know. Baby, pregnancy, yada, yada. But still. It's hard. Also, stairs are my nemesis. Classes/Exercises: Weirdly, boot camp has become my class of choice lately, mostly because it's the easiest to modify. I can do spin, but it's hard to be the only one sitting and that round ligament pain is no joke going from the saddle to standing. I still do spin because I love it and I like to switch things up, but I'll probably do more boot camp as I get further along. I've also started doing some push-ups on my stairs. I'm in a health/accountability group on Facebook and someone suggested doing push-ups on the stairs instead of on your knees. Those are no joke! But I feel like they're working my upper body really well. It's the equivalent of doing them on your toes, but at an incline to help. Plus, it gives me more room. That's about it! Happy Friday folks! How are your journeys going?! You’re awesome for sticking to your workout schedule! Go Sarah!! :) And look at that cute bump! I love it!